After much speculation, the young newly crowned Ooni of Ife will taking a second wife. Oba Adeyeye Ogunwusi, will have his traditional marriage to Wuraola Otiti Zynab on Saturday 12th March 2016 at 12 noon at the Edo Hotel premises, Benin City, Edo State. 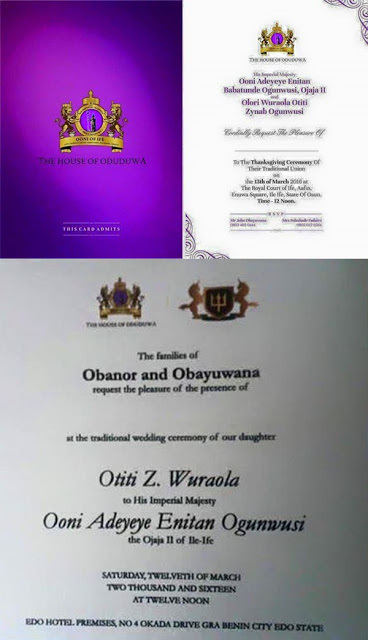 The new bride is a niece of John Obayuwana, Chairman of Polo Luxury. Hmmm, Rumor has it he is separated form his first wife whom he wedded in a church. See the invite after the cut. Ouch, I thought that Ottawa last was up next, sad. Next time.